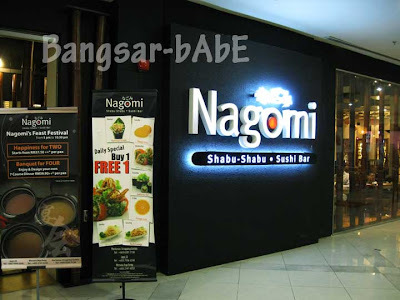 It was Han’s birthday last month and we had dinner at Nagomi Shabu-Shabu, Hartamas Shopping Centre. Since there were five of us, I requested for a private room. I ordered the duck shabu-shabu set, Jeen had the rib-eye set while the rest had the chicken set. 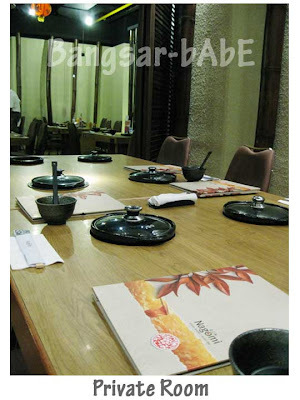 All sets come with a choice of broth (Nagomi, Chicken or Spicy), a bowl of rice and assorted vegetables. For the duck and chicken set, we had the chicken broth while Jeen chose the Nagomi broth for her rib-eye. While both the broths were delicious, I liked the chicken better as it has more flavour. The Nagomi broth is clearer and lighter. 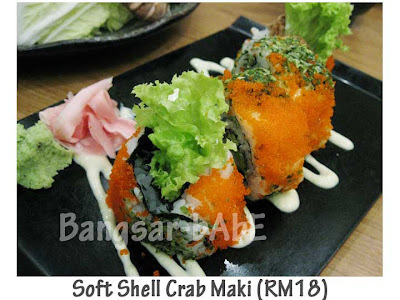 We also shared a plate of Soft Shell Crab Maki. Crispy soft shell crabs wrapped with rice roll, coated with fish roe and served on top of mayo drizzles, it was scrumptious! 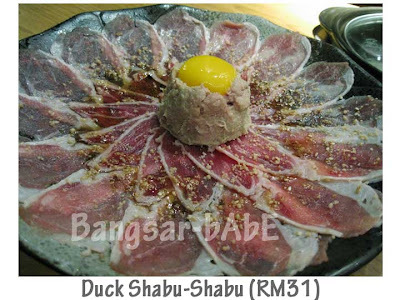 The duck set comes with duck slices and minced duck meat in the center with a raw egg on top. 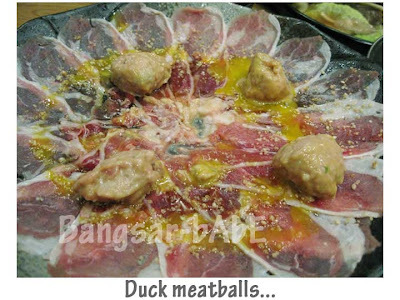 The waiter formed meatballs out of the minced duck. The duck slices were tender and the meatballs, very well-flavoured. The vegetables were very fresh and crunchy. Surprisingly, I finished all of it – an amazing feat for a carnivore like myself. Apparently, they soak the vegetables in icy salt water for 20 minutes to prevent oxidization and remove pesticides, residues, dirt, insects and bacteria. 1. 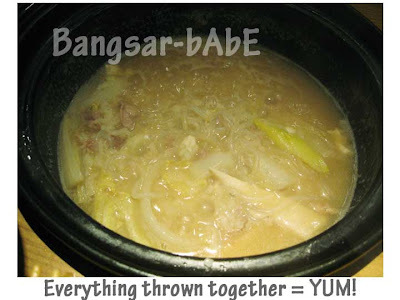 First, cook the white vegetables, mushrooms, bamboo shoots, onions and leeks to enrich the broth that will later bring out the sweetness of the meat. 2. Dip the meat slices into the boiling broth, and swish it back and forth for less than a minute. 3. Then dip the cooked meat in Chili, Ponzu or Goma sauce. 4. Alternate between cooking the meat with other green-leaf vegetables and tofu. 5. 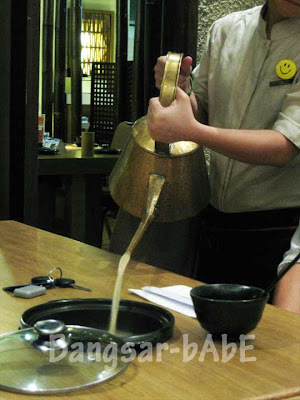 Pour the bowl of steamed rice into the now “kao” broth. Let the congee simmer a little, enabling the rice to absorb all the goodness from the broth. Of the three dips, I liked the Goma (sesame) best. 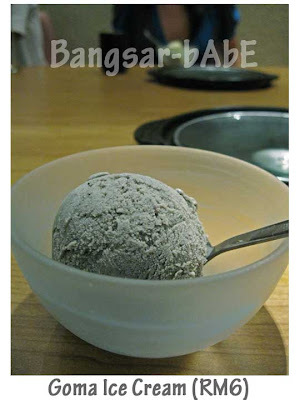 Made from ground sesame, soy sauce, kelp stock, sake and sugar, with a combination of seven different sauces. Very peanut-y. Ponzu sauce is made of soy sauce and juice pressed from a bitter orange, sweet sake and kombu (kelp). The chili sauce was alright, I didn’t fancy it much. Towards the end, I poured the rice, balance of duck slices, vegetables and tofu into the very flavourful broth. 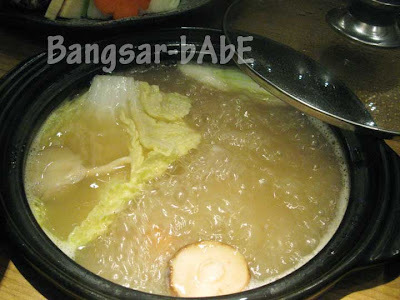 The result was a delicious combination of rich, savoury broth, ingredients and rice, with a porridge-like consistency! I had Goma ice cream for dessert. Jeen who had the pistachio complained that it tasted like cough syrup. Everyone else agreed that pistachio tastes like cough syrup. In the end, I let her have my goma and ate the pistachio (did I mention I LOVE cough syrup?). 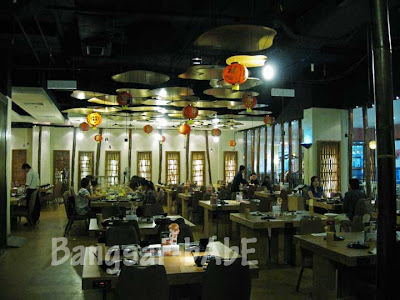 All in, dinner cost RM261.05 for the 5 of us. Slightly more than RM50 per head. While the atmosphere is good, I found it slightly on the expensive side. Verdict: Pretty good food, but a tad pricey. some say this is great..while some say its ok..looks like need to try myself..
anyways thanks for recommending me to Shivz..its really affordable for bangsar!